Please call our office on 01487 500064 before purchasing any of our systems for the most competitive prices, we are always happy to do our best to make the customer happy. Wall mounted unit (very nice looking). 7.1 kw cooling - 8.0 kw heating. Would suit a large living room, dining area, conservatory or office. Slim design In addition to more attractive aesthetics, the new design of the front of the units provides easier cleaning as the air return remains hidden at the top and the front fascia has no air inlet. The unit is a slimline construction only 198mm deep. The turbine fan is able to work at lower revolutions and minimises the noise thanks to its greater diameter. Compact low noise outdoor unit The outdoor unit is made from material are smaller and weigh less whilst increasing their resistor to the outside. Among the many qualities of HSP is the noise reduction as a result of the absorption of vibrations and the incorporation of unique details, such as the protection of the connection valves. Product Key Feature's High CoP, up to record 3.61 Infra-red controller Slim construction 198mm Pipe runs up to 30 metres Low noise 52dBA on low Back-up switch for loss of controller Cold draft prevention on heat pump start up Fault diagnosis Auto re-start after power interruption PRE-CHARGED WITH REFRIGERANT for up to 30 metres pipe length Low ambient tested to -15 Deg/C in heating. Light weight noise absorbing outdoor unit. 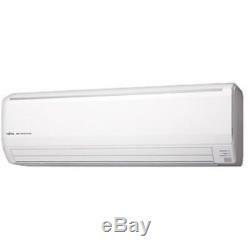 ASY Wall Mounted ASYG24LFCC Power source 1 ph 240V Type Inverter rotary COOLING (nominal) max. KW 7.1 / 24000 BTU HEATING (nominal) max. KW 8 / 27000 BTU UK Cooling (max) kW n/a UK Sensible Cooling kW n/a E.
N/a Energy label in heating A Energy label in cooling A C. Please read this important information before purchasing. All split, twin and multi air conditioning units contain F-gas, and is governed by F-gas regulations. Under EU regulations: The installation of all systems containing F-gas (R410A, R32 or R407C) require installation or commissioning by a F-gas certified air conditioning engineer. (MUST NOT BE ATTEMPTED IF YOU ARE NOT QUALIFIED). All of our products include VAT of 20% in the list price. 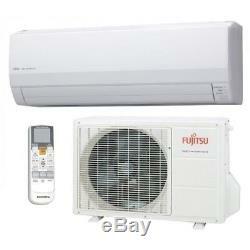 The item "Fujitsu Air conditioning ASYG24LFCC (7.1Kw / 24000Btu) Wall Heat pump Inverter" is in sale since Thursday, March 15, 2018. This item is in the category "Home, Furniture & DIY\Heating, Cooling & Air\Air Conditioning". The seller is "greenclimateservicesshop" and is located in Huntingdon. This item can be shipped to United Kingdom.